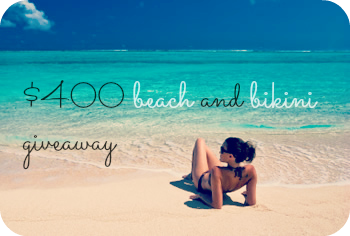 Heather Giustino Blog: $400 beach + bikini giveaway!! $400 beach + bikini giveaway!! Spring is finally here, and you know what that means - SUMMER will be here before you know it!! To help you kick off the warm weather season, some blogger friends and I would like to give you a head start on planning for your next beach getaway and new bikini. I would travel to Gulf Shores AL. One of my favorite beaches in the US. I would go to Hawaii or maybe the Keys! Where would I go on my beach vacay? I'd love to visit the Greek islands, but I think Croatia might be bit more practical for me right now! I would LOVE to go somewhere in Mexico! I've only ever been there for volunteer work, but between the beaches, culture and amazing food I can only imagine how fun it would be for a tropical vacation! I would travel to the Caribbeans, somewhere kind of remote. I haven't taken ANY vacation in two years and just being away from everything for a bit, on a sunny beach, preferably with some fruity frozen drink is exactly what I need. Thank you for the giveaway! I would go to Florida!! My family is already planning a vacay to San Diego this summer, I'd use it there! Great giveaway, thanks for hosting! I would love to go to St. Thomas! I desperately need a beach vacation! I would go to Mexico to spend time on the beach with my husband for my 30th Birthday! I would use it for a beach vacation in Mexico with my hubby for my 30th Birthday!! I would use it for my summer trip to Texas. I would love to go to Turks & Caicos but I've also never been to Mexico so I'd choose between those two. :) the warm sandy beaches are definitely calling my name! Dream spot? Fiji. Realistically? On my vaca to disney later this month! ah great giveaway! I'd probably go to the Keys! I would go to Hawaii to visit my best pal! I'd head down to Miami for a few days! We would probably go to Hawaii. Never been and it would be a great way to spend our 1 year wedding anniversary! I would getaway to Ocean City NJ! !I can feel the sand between my toes already! i woud go in brazil or maybe barbados! they are always in my dreams! Anywhere with my baby! It would be wonderful to go to the west coast! Vero Beach, Marco Island, Key West...all of the above! woohoo! happy to work with you again! I love Victoria's Secret swimsuits, crossing my fingers! San Diego or Florida or the Caribbean or even just Texas. I'd love to go anywhere! Oh my gosh! I'm actually planning a birthday trip to California this summer, so this would be AMAZING to win! I wanna go to gulf shores , AL ! I've never been but it looks like a gorgeous place to take my family !!! I'd love to take my family to gulf shores , AL !!! I would either go to New Orleans or Mexico. I'd use it to travel to a remote NKOTB concert this summer! Since I just got back from St Augustine, Florida...I'd head back there! Love St Augustines! I'd love to take my kids and I to So. Carolina to visit my Dad. Ideally I would go to Hawaii. I would go to the New Jersey Shore and visit my family! I would definitely go to Ocean City, Maryland. I love it there! I'd go to the mountains. I'd love to go to Atlantis! I'd probably go up to San Francisco. I'd go to Laguna Beach! It's time for me to visit San Francisco again! I would go to Myrtle Beach. I would love this!! I would use it to visit the coast of Mississippi and how my husband all the things my dad showed me when I was a kid. The Gulf Coast is far underrated. Oahu! I'd love to be at the lagoons at Koólina right now. The Caribbean - I've never been! Somewhere warm, I'm so over this Michigan winter that won't go away! I'd go to Topsail Island in NC! I would go to Pennsylvania to visit relatives. Back to Puerto Vallarta! We went on our honeymoon in 2011 and are crossing our fingers we can save enough to go back for our 2 year anniversary this year. Chicago! I've been dying to go back for so long now. Any beach is fine with me! I would go to the Texas coast to see friends I haven't seen in a while. I'd go to Biltmore Estate. It's one of the best places with crystal clear waters located on the west side of the Florida panhandle. I would go to California. Thanks!! Tampa where I can spend time at the beach and with my Aunt. we would go to atlanta, ga! i would absolutely love to go to catalina! I'd like to go to Delaware. I would like to go to Peurto rico. I'd go somewhere toasty and lovely. Maybe St. George Island, FL or somewhere I've yet to travel. Fun giveaway, y'all! So generous! I would like to use it when I visit my daughter again. Thanks! I would go to Pagosa Springs Colorado-it's gorgeous! I'd like to go somewhere new, like Baltimore or North Carolina. Thanks for the giveaway... San Diego ! Jeju Island, South Korea. Amazing.